Hmm. It has been forever since my last post. Over four years! Life really took over - didnt it? So where am I on my journey now? I thought I had it all figured out.. hmmf. Boy was I wrong. Ive decided to start back writing on this blog and it will be like my own personal (ok that is ridiculous) my own very public diary. However, I won't be pontificating from above - the way I felt I was qualified to do 4 years ago. It will be an account of my continuing journey to the God within - my Emmanuel Journey. Well I am still a truth seeker - thats for sure. Sometimes I think I have it all figured out and sometimes I feel like I have no center. Right now, things are pretty low. On the outside it appears that I have all the trappings. To others I am a successful attorney, businesswoman, activist of sorts, nice car, nice house, son going off to college.. new rock star boyfriend!! (lol - well that last one not many people know about). Hmm am I going to come out of the closet on the internet?? I think not! You guys will have to wait for that one. Hehehe. Anyway - all these apparent markers for success but am I?? Well the thing about being involved in so many different things is that it is easy when you are focusing on one thing for everything else to go by the wayside. When that happens, you need to navigate alot of stuff to deal with the fallout. Life is sometimes like juggling several balls and hoping none will fall. For me.. I think some of my balls have been dropping. Some I still have up in the air - but I need to find a way to pick them back up without dropping the others. Hmmm that's it. I want to be a better juggler because everytime I drop a ball I feel like a failure. And it doesnt matter how high or fast I am able to juggle the rest. Perhaps the key is to go slowly. Start with one ball, take your time with that one and make sure you can juggle that one ball well and then slowly increase to two and take your time again. Take as long as you can - the race is not for the swiftest but for those who endure to the end. Then go to three, four.. as much as your capacity can handle. How do you know what you can handle - well, one needs to take a cold hard look at one's skill level and competence. If you want to juggle another ball - this requires more skill - so you need to up your skill if you want another ball. 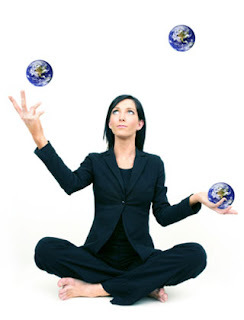 The juggling analogy is certainly helpful if one meditates on it. So what if you're like me and you've dropped a ball or two because you moved a bit too fast when you were adding balls - how do you pick them back up and continue without dropping the others? Can I just drop all the balls, press rewind and start over with one? Making sure that I can creep before I walk, and walk before I run? For me, because alot of people depend upon me, I can't just drop the balls without hurting others, and that I don't want to do. If in your situation you can drop all your balls and start over with one - thats the best bet. If you're like me, I think one still needs to press pause for a second. Stop worrying about the balls you have dropped. If there are still three in the air, slow the pace down, focus on those three and make sure you can do them well. If you have a friend or family member that you can rely on - what is really wrong with asking for help? Ask them if they can pick up a ball or two for you. They may be able to do so, because they have their own skills and competence (wisdom) that they have developed over the years - maybe they have the capacity to help others with their balls, for a while. Slowly increase your capacity and then when you are skilled enough, lower yourself slowly and pick up one of the balls and add them. Remember not too fast and take your time with each new one. Make sure it fits into your life snugly. Make sure you're comfortable and skilled with the new number of balls before you begin picking up again. And how do you stop worrying about the ones that you have dropped? Make a plan. Set a goal. Say I have to become a master at the balls in my hand in lets say two months - then I will pick back up another ball. Then what if life throws you a curve ball. You didn't plan for it but you must deal with it anyway. That's when you walk in faith that the universe is everyday conspiring for your good. Maybe that curve ball was sent to stretch you. Maybe you had gotten too comfortable with just three balls and maybe you could handle a bit more. You can sometimes really surprise yourself at just what you can do.. instead of focusing on what you think you cant. And sometimes Life helps us to find out our true potential. That's all I can say - and that's what I am trying to do right now - stretch. I'll let you know how it goes..